"Planet of the Apes depended on characterization as well as adventure. If you've got good characters, they'll stand the test of time." When Fox released their Planet of the Apes - The Evolution box set, it was the only place to find the excellent Apes documentary, Behind The Planet of the Apes. Some people (such as myself) who only really liked the first Apes film complained that we would have to buy the whole box set to get at the documentary. Well, Image has released Behind The Planet of the Apes in a new two-disc special edition set. Thank you, Image, you've done a great service to fans of the film and people who want an in-depth view on how movies are made. Behind The Planet of the Apes, along with The Hamster Factor, The Battle Over Citizen Kane, and Hearts of Darkness: A Filmmaker's Apocalypse, is among the best documentaries about moviemaking in the history of the medium. Over the course of its 2-hour-plus running time, the film goes over each Apes film in minute detail, resulting in a new appreciation for the entire series. Planet of the Apes gets a little more attention than the others, if only because the genesis of that film laid down all the innovations and techniques that would be used in the follow-ups. The portion of the documentary that deals with the first film has the most interesting behind-the-scenes footage, which includes makeup tests, set design ideas, and clips from the infamous 1966 pre-production makeup test with Charlton Heston, Edward G. Robinson, and James Brolin. We also see interviews with Charlton Heston, Kim Hunter, and others, and hear how to act in the ape makeup (over-accentuate every facial movement, and it will bleed through), interesting lunchtime stories (different ape "species" ate with one another and stayed away from other "species"), and much, much more. It seems as if each film in the series gets less and less screen time in Behind The Planet of the Apes (which seems to fit in with the way that each successive film got a smaller budget, regardless of the box office success of the previous one). Beneath the Planet of the Apes is dealt with pretty briefly; most of it revolves around doing the makeup for the mutants and the sets (which are probably the most impressive sets of any Apes film), and also talks about how Heston suggested the apocalyptic ending in order to stop any more sequels being made (nice try Chuck, but no cigar). Escape from the Planet of the Apes gets somewhat better coverage, talking about Sal Mineo's inclusion (and his relief at the character's quick demise, as he hated the makeup), and the funnier nature of the film when compared to the rest of the series. We also get some fun interviews with Ricardo Montalban. There is a good deal of information about Conquest of the Planet of the Apes, including some great interviews with director J. Lee Thompson (director of The Guns of Navarone and the original Cape Fear among others). The most interesting segment of the Conquest section is comparing the finale to certain 1960s riots, including cross-cutting between footage of the actual riots, and then back to the scenes in the movie. I always knew there was a political undertone to all the Apes films, but never did I expect such a clear-cut, yet subtle connection to actual political events (aside from the picketing apes in Beneath the Planet of the Apes, which always seemed so overtly silly to me). Battle for the Planet of the Apes is passed over pretty quickly, simply stating how they softened Caesar's character, and Thompson complained about the budget, which was woefully small. The TV series and cartoon show are briefly mentioned. The best thing about this documentary is the way it gives the viewer a better appreciation of all the films. For example, seeing the riot basis for the climax of Conquest has made me want to see it again, as well as some other clips which reminded me that I haven't seen most of these movies for years. The documentary gives you exhaustive amounts of information about the series and about moviemaking in general. I'd recommend this to Apes fans and more casual viewers alike. Image Transfer Review: This transfer doesn't seem to differ much from Bob's assessment of the previous release (see Behind The Planet of the Apes), with sharp colors, realistic fleshtones, and solid black levels. However, the film clips looked better to me than Bob said they did in the box set version. Either Image used clips from the DVD, or I'm just so used to these movies looking bad on television that I think they look pretty good here (I haven't seen the DVD transfers, so I can't say for certain that Image has used them). Audio Transfer Review: Being a TV documentary, this is a fairly simple stereo mix. Dialogue is mixed toward the center, while the movie clips use both speakers. Everything sounds fine, and I'm not really going to expect a 5.1 mix for a documentary (even Stanley Kubrick: A Life In Pictures only used its 5.1 mix for the scores in the film clips). Extras Review: Since this documentary already existed on DVD, the big selling point here is the extras, and, boy, there are plenty of them. On the first disc we have a presentation for the members of N.A.T.O. (that's the National Association of Theater Owners), which is several clips of the first half hour or so of Planet of the Apes, and then Charlton Heston talking a bit about the film. It's fluff. We get a 1968 featurette about making Planet of the Apes, and considering we've just seen Behind The Planet of the Apes, it actually manages to convey some information we didn't get in the documentary proper. 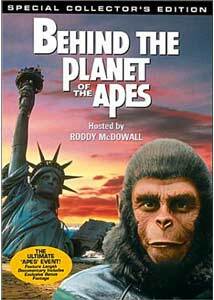 Then comes A Look Behind The Planet of the Apes, which must be one of the worst featurettes I've ever seen. First, it tells us nothing we haven't seen already, and secondly, it actually uses large segments from the previous featurette. A man with a thick New York accent who sounds like he doesn't give one damn about the movie narrates it, and he's actually hilarious to listen to. Still, I've never seen such a hack job. Even useless studio fluff usually looks good and doesn't blatantly rip-off other making-of shows, complete with a different narrator. There is footage of Don Taylor directing Escape from the Planet of the Apes, which also includes a short interview, and is marginally interesting, unlike the extremely short segment showing J. Lee Thompson directing Conquest of the Planet of the Apes, which doesn't show much of anything. We get a promo for Behind The Planet of the Apes and trailers for every Apes film, as well as DVD credits. The real treasure of Disc One is a digitally remastered full version of the Edward G. Robinson makeup test, of which we see clips in the documentary. This test is a priceless slice of movie history, and some of the dialogue is actually better than in the full version of the film. Disc Two contains an unedited interview with Roddy McDowall that goes on for almost an hour-and-a-half. This is an incredible interview, with McDowall talking about a whole range of Apes related topics. While not quite as informative as the documentary, this interview comes close, and is alone worth the purchase of the disc, even for those who bought the box set and already own Behind The Planet of the Apes. The other extra on this disc is about 20 minutes worth of outtakes and dailies from Planet of the Apes. While this sounds like fun, it's mostly dailies from the cornfield attack, and so it gets somewhat tedious. Still, the only sound is the score, which is great, so you might be inclined to turn these on when you have to do something else in the room. A superb documentary, Behind The Planet of the Apes is sometimes better than the actual movies of the series it documents. With rare behind-the-scenes footage, new interviews, and more than I could possibly list offhand, this is one of the best documentaries about filmmaking that currently exists. Image's new special edition with hours of new footage make this a must-buy, so go out and get your stinkin' paws on a copy of it now!